Structural steel is an essential material for many buildings, delivering uncompromising strength and durability that is made to stand the test of time. While steel structure design serves to provide complete control over the variables across your project, it’s important to remember that receiving the plans from your architect and passing them onto your structural steel fabricators is simply not enough. A steel detailer needs to generate the drawings required to communicate complex processes, including viable updates and changes when needed. If you are looking for a steel detailer to provide comprehensive control over your building operations, be sure to reach to reach out to Sanilac Steel! Our structural steel fabricators in Michigan have worked hard over the last half-century to provide amazing results across each and every project. Since 1967, we’ve worked to provide complete steel structure design, fabrication, and erection services. Finding your steel detailer can often make or break the long-term efficiency and affordability of your project. Today, we’ll highlight the full value that a detailer can provide for any site. If you’re in need of a steel fabrication company to meet your project needs, be sure to contact us now! Architects, who design the overall look, feel, and flow of the building. Engineers, who are tasked with calculating the load demands to provide sound reinforcement. Steel fabricators, who specialize in creating precise materials to match job demands. Steel erectors, who require the information needed to accurately raise and secure a building. Welders, who rely on details to highlight spot-specific tasks and requirements for quality bonding. 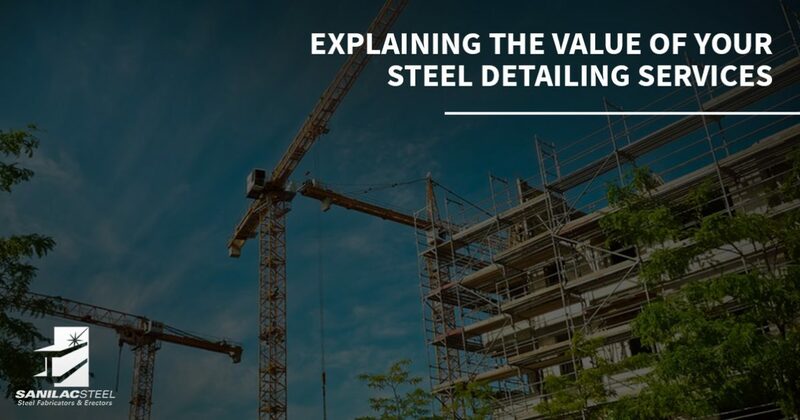 As you can tell, steel detailers must have the experience and know-how to provide streamlined and accurate results for multiple builders across the site. Architects will plan the building and engineers will determine the design demands; it falls on the detailer to mesh the two to create an understandable document for in-field use. Sanilac Steel is here to provide comprehensive quality for your project, and our local structural design experts will work with you every step of the way to ensure the best possible results. Clear communication is vital, as your project will rely on numerous steps that all must be completed precisely for the best results. Contact us now to learn about our steel detailing, and be sure to ask for your quote! While every role is important throughout the construction process, the reality is that your steel detailer will need to perform an excellent job to complete the project smoothly. AISC, OSHA, and other regulatory industries all place intense demands on modern builders dealing with steel structure designs. Every project is different, with some being classified as more challenging or sensitive than others. Our structural steel contractors are here to fill this integral role. Sanilac Steel can also provide amazing results in other facets of your project. We proudly provide your turn-key structural steel solutions, from design and detailing to steel fabrication, erection, and more. Our structural steel fabricators have enhanced Michigan projects since 1967, and we’re ready to prove our worth on your site. Contact us today to learn more about steel detailing, and be sure to request your project quote!